The Notepad program has been the part of all versions of Windows operating system ever since its introduction with Windows 1.0, back in 1995. While Microsoft has enhanced and overhauled most of the areas of Windows operating system in the recent versions of Windows, the Notepad program hasn’t seen much love from the developers at Microsoft. Because of this reason, a number of free third-party programs have surfaced over the last couple of years to replace the native Notepad. Notepad++, as you probably know, is one of the popular and widely used Notepad alternatives. While Notepad is good to quickly take some notes, it lacks many features and spell check is one of them. If you often use Notepad and miss the spell check feature every time you use it, we recommend you either install Microsoft Office Word or other free alternatives (there are plenty). 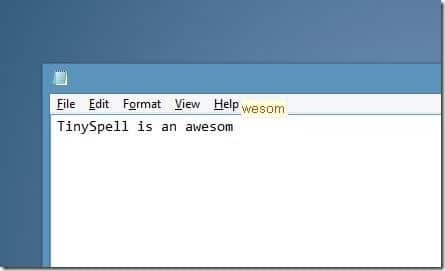 But if you are in love with Notepad or WordPad for some reason and would love have spell check feature in these programs for free, tinySpell (yes, tinySpell) is the ideal software for you. 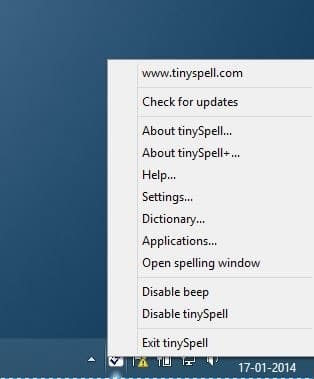 tinySpell is a free program (paid version is also available with more features) designed to help you get spell check feature in all Windows applications, including WordPad and Notepad. In addition to that, tinySpell service is available when you’re renaming a file and searching for a file using Windows Explorer search. 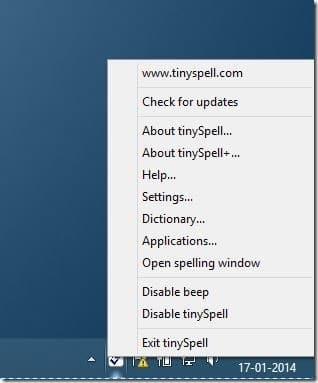 Tiny Spell alerts you when you misspell a word and offers suggestions as well. 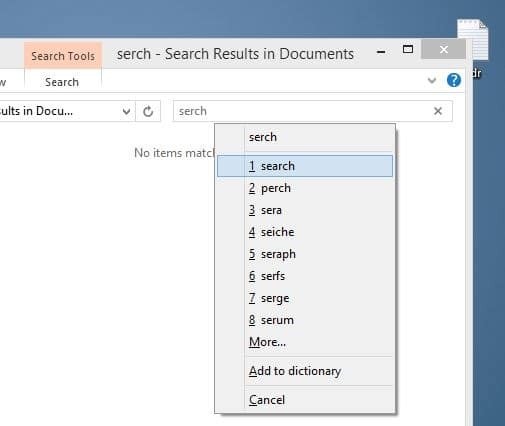 UPDATE in July 2018: If you are on Windows 10, you can get auto-correct feature for any program by turning on auto-correct misspelled words feature. It also allows you search a word with Google search. 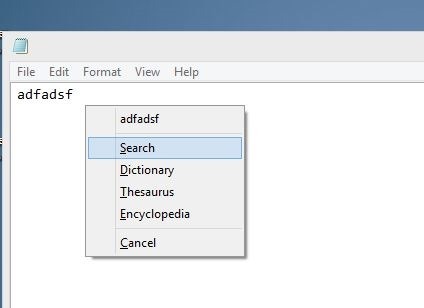 After typing a word in Notepad, WordPad, or any Windows application, simultaneously press Ctrl + [ keys to see Search, Dictionary, Thesaurus and Encyclopaedia options. You can also add your own custom words to tinySpell’s dictionary. 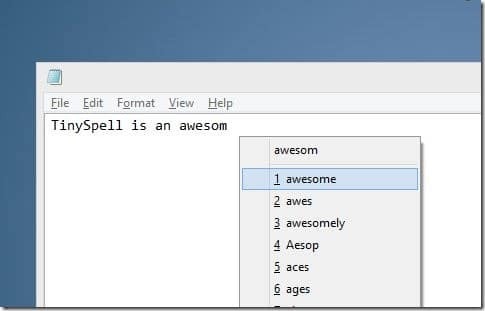 To add your own word to its dictionary, right-click on the tinySpell icon in the system tray, click Dictionary to open the same, click Add button and then enter a word that you would like to add. 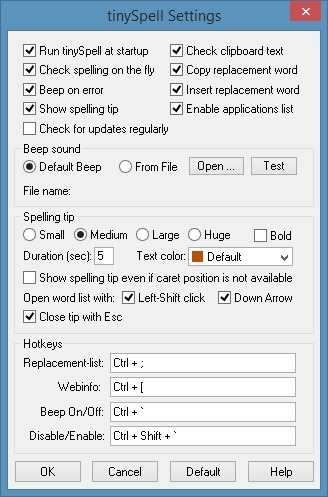 As we mentioned above, tinySpell offers spelling check service for all programs. But if you want to use it to work with Notepad and WordPad only, you can configure tinySpell to work with your desired programs only. 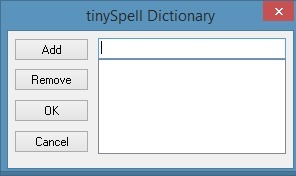 Right-click on the tinySpell icon running in the system tray and then click Applications to configure tinySpell to work with certain programs only. Under Settings, you can change the default hotkeys assigned for replacement list, beep on/off, disable/enable Tiny Spell, and Webinfo (web search). All in all, it’s a handy program for users who prefer using Notepad over other programs without having to worry about spelling mistakes. 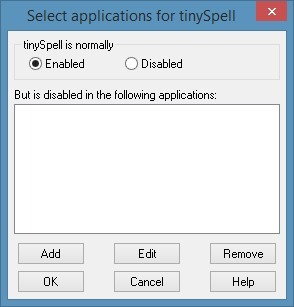 tinySpell is fully compatible with Windows 7, Windows 8, and Windows 8.1. Please note that tinySpell works in desktop environment only and not in Metro Start screen and apps installed from the Store. 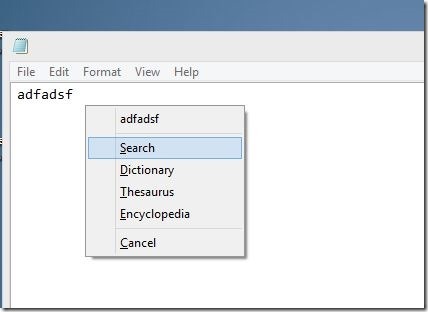 NOTE: With default settings, you need to press the left Shift key to view word suggestions for a misspelled word. We suggest you enable down arrow for the same under Settings to easily view suggestions. Start using LibreOffice. Its free and complete office package.